Pre-match selfie with Jacob. Wales never really got going, Scotland more inventive. 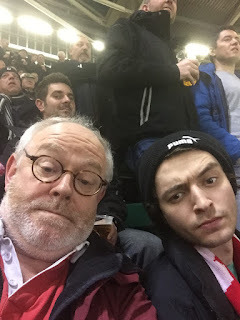 Exciting game, and a just about deserved win, but expecting better against France and especially England (a game I can't honestly see England allowing themselves to lose - so much face to make up). If England win today they must be favourites for the Championship. Forza Sergio! So much for Forza Sergio.